The seventh edition of the Dietary Guidelines for Americans "places stronger emphasis on reducing calorie consumption and increasing physical activity" - critical in a country in which more than one-third of children and more than two-thirds of adults are overweight or obese. Bravo for sounding an alarm on portion sizes and overeating! Criticisms? You betcha! First, why suggest loading up on fruit on every plate (#3) when they could have been specific and said Eat less meat, or Switch to lean protein. I would love to see the USDA encourage fat comparison on foods, similar to the sodium challenge. USDA still has meat and cheese all over their hands. And really, why leave sugar out of this message. #5 should really read, Compare sodium, sugar and fat on packages and choose the foods with lower numbers. To #6 I would add fruit juice as something to avoid - as in, Drink water instead of sugary drinks or fruit juices. That's all until they produce the new Pyramid. The fact is, most restaurants are dangerous to your health. Every meal we eat out adds an average of 134 calories to our daily intake. And if you eat out as often as the average American man does (at least three times a week), those calories could tack on at least 6 pounds of mass every single year. Let's be clear: That's flab—not muscle. And if you eat out more, you gain more. 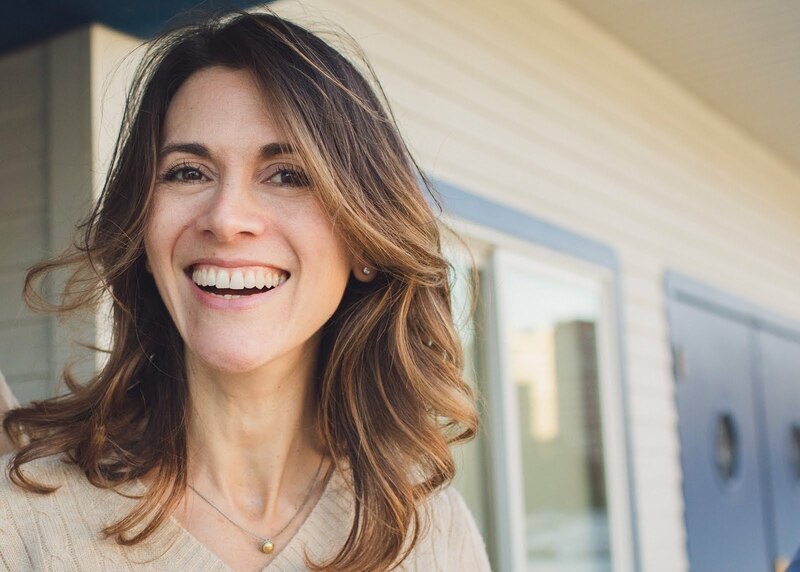 The article highlights good options and horrible ones at the nation's restaurant chains. Making the A list: Red Lobster, Chipotle and Panda Express. Meant to feel shame: Cheesecake Factory, P.F. Chang's, California Pizza Kitchen. And Olive Garden, of course. Last week it was all about the logo. The ubiquitous mermaid is getting an overhaul. They're zooming in again - something they've been doing gradually over the company's 40 years. 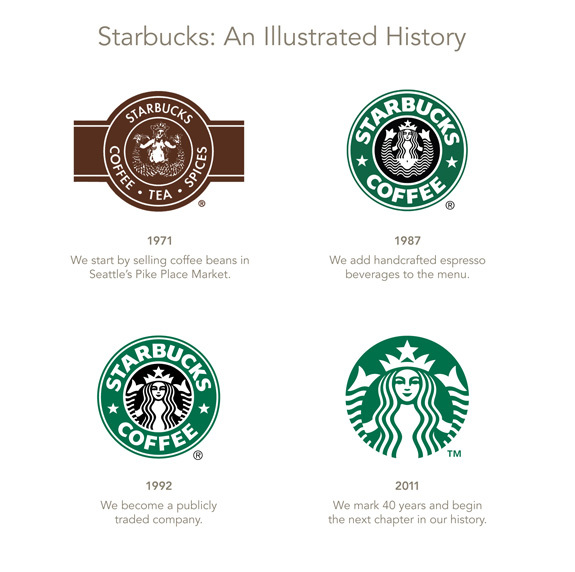 Historically, zooming been a good thing, especially in the 1992 logo change when the close-up cropped out her mermaid parts. And I don't mean her twin tails. See the logo progression here. This week it's about the Trenta. Yes, Starbucks has joined ranks with 7-11 and every fast food chain to bring you a (nearly) 32-ounce beverage in a Giant Plastic Cup. A shout out to the genius at HuffPo for noting that the capacity of the new 31-ounce Trenta exceeds that of an adult human stomach. Meanwhile, Colt-45 is like, "Welcome to the rodeo." This brings me to my biggest complaint with Starbucks: recycling. I'm all for massive coffee consumption, but the volume of paper and plastic cups that they've heaped into landfills is unforgivable*. Starbucks empties are like land mines in my littered urban metropolis (disclosure: I live one block away from two different Starbucks). The paper coffee cups are lined with plastic, rendering them unrecyclable while the plastic cups for iced drinks are made from plastic #5 which cannot be recycled either. The website cites two different goals for 2015, one states a plan to serve 25% of beverages in reusable cups, the other aims for 100%. The Trenta shouldn't be a surprise, and yet it is. Starbucks lost its cache when they automated the grinding and espresso pulling process but there remains something empirically sophisticated about espresso. There is, to be clear, nothing sophisticated about a Big Gulp. There is no such thing as Hobo Chic. What they should have done is honor their 40th anniversary with a recycling campaign where their drinks are served in recycled 40s. Then everybody wins. * Hello Starbucks-sponsored recycling bins? Brush on bread (frozen is fine) using silicone basting brush. Bake in a preheated 375 oven for about 5-15 minutes, depending on oven size, until golden brown at the edges and fragrant. 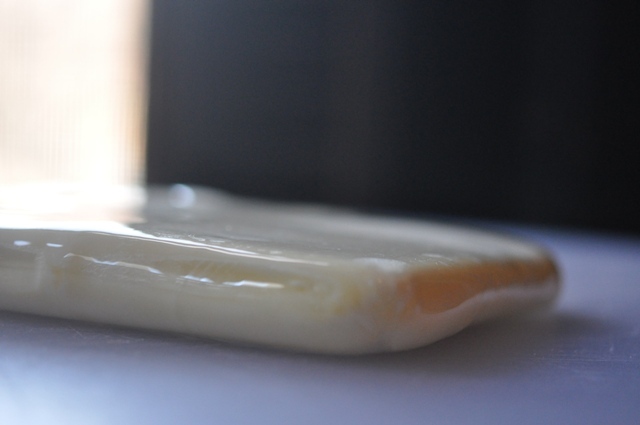 You transformed a pound of butter into a thin-ish slab and refrigerated it overnite. You made the détrempe, cut a number-sign into the top and refrigerated it overnite. You realized that the dude who played Ethan on 24 should get the ball rolling on a made for TV movie in which he could star as John Boehner. Oh, that was me. Nevermind about that. I'm glad you're back! You will be so pleased with yourself for having done this. So, first thing, get set up. 1. Remove the détrempe and butter block from the fridge. 4. Read through all directions before starting, so you know what to expect and can troubleshoot on the spot if necessary. NOTE: Make sure to use dusting flour very sparingly. You don't want to end up with too much flour in your pastry. First, we're going to roll out the détrempe. You want to end up with a large square, about 14"x14"
Dust the counter with a tiny bit of flour and start rolling - don't dust the top of the dough. Too much flour will make the détrempe just slide around. If it is sliding around too much, just flip it over and don't use any additional flour. 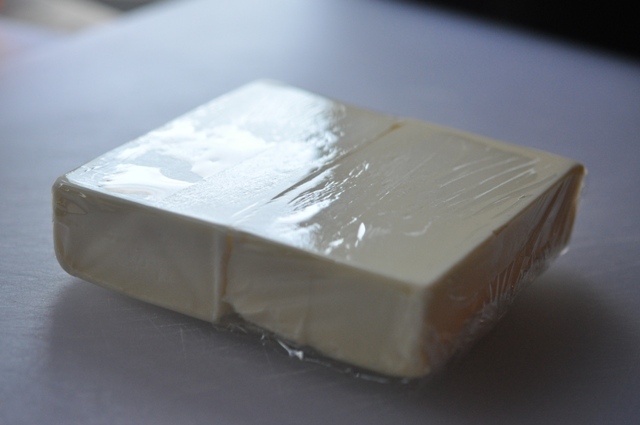 Once you've got a nice large square, unwrap your butter. Determine which side of the dough has more moisture (the side that was floured will be the drier side) and plop the butter in the center of that side. Fold the pastry dough up around it, forming a neat package. Now, dust the counter with another little bit of flour and, with a gentle firmness, start rolling. 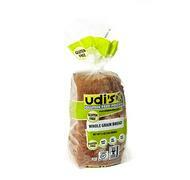 You want to keep the integrity of the shape without letting the dough upwrap itself. It will gradually get easier, as the butter inside softens. Just start with less pressure and add more. 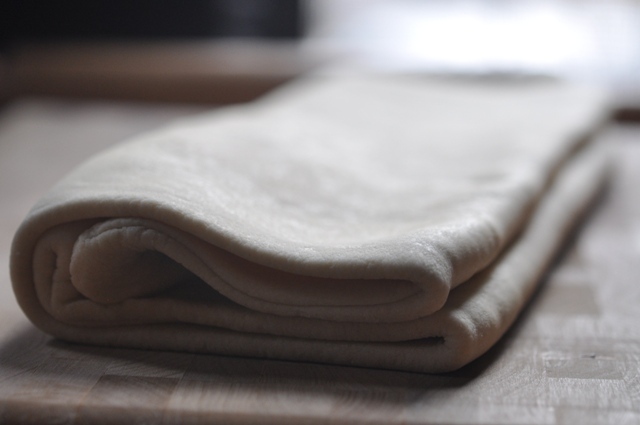 You can flip the dough over while rolling it out - this both makes rolling a little easier and allows you to check the surface of the dough. 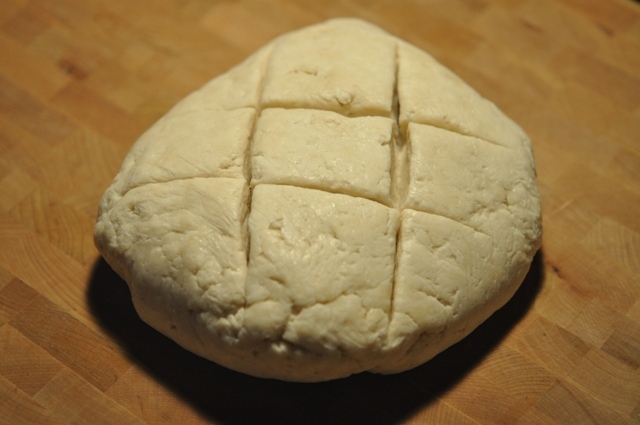 On occasion you will get fissures in the dough, little butter blowouts from counter pressure. If this happens, don't panic, just sprinkle the spot with flour and continue a little more gently. Roll the square out into a rectangle, about 24"x13". Now, you're going to do the first of five book-folds. Dust the counter again, a little more generously this time. Start rolling again, this time with extra care as from this point on, butter blowouts are more common. 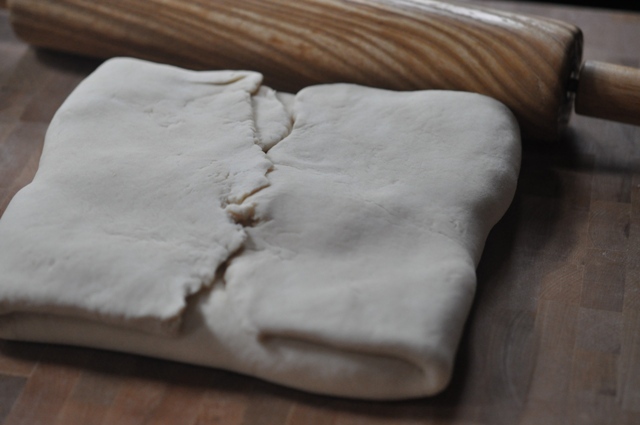 Just be gentle and slow, and turn the dough frequently to check both sides, adding flour to blowout spots as needed. 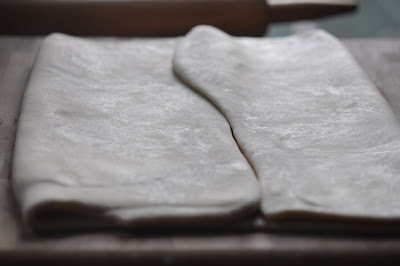 Roll the dough into another rectangle, pushing it wider and longer until it measures about 32"x9"
Do another book fold, then wrap well in plastic and retire it to the fridge to rest and chill, for 2 hours minimum. At this point you'll notice your dough looks much smoother than it did after the first book fold. Congratulations! You now have a 16-layer dough. After two more book folds you will have 256 layers. You will do three more book folds to get to the 1,000 layers. Honestly, I get a very puffy pastry with four book folds. I'm going to play the fifth fold by ear today. Either way, repeat the above process, rolling out a large thin rectangle, and book folding two more times. Then refrigerate for another two hours. If you want to do the fifth fold, do so after two hours of chill time. I'll add the finale with images in a third post later. 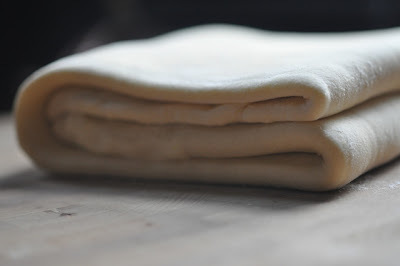 Puff pastry is one of the first things I made when I became an apprentice in the sweet kitchen. Just weeks into a job for which I held no credentials my boss told me she was going to teach me how to make it. I was beyond thrilled. I snuck off to call my husband to share my excitement. Oh, I was such a rube - I thought I was going to make phyllo dough. 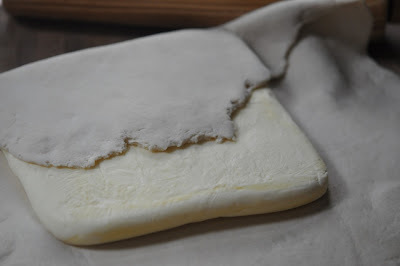 The first thing to know is that making puff pastry involves some down time. On Day 1 you make the détrempe (the dough that is folded between layers of butter) and prep the butter layer. On Day 2 you do the rolling which turns the two into mille feuille, or 1,000 layers. This is achieved by the basic act of a series of folds - five, to be exact - each fold quadrupling the number of layers. So...good butter. European butters have a higher butterfat content - and lower water content - making them a better choice for puff pastry. I picked up a pound sized block of Plugra and recommend you do the same. If you're in Chicago you can find Plugra at Treasure Island. Trader Joe's used to carry it at a much better price but hasn't had it in awhile. Once you've got your butter in hand you're ready to start. Day 1 is very short and simple. Follow the first part of the recipe and meet me back here for Day 2. 1 pound unsalted butter, best quality, ideally in a solid one-pound block. Wrap with plastic wrap, leaving some room for the butter to stretch into. Then take a rolling pin and beat the heck out of the butter package, really solidifying the butter into one thin square, about 1/2-inch tall and about. You can use the pin to roll the butter out, too. When you've got to about 7x7 and about 1/2-inch tall, retire it to the fridge overnite, wrapping it in an extra piece of plastico if the first piece ripped anywhere. Fill a 2-cup liquid measuring cup with ice and water. Reserve. Combine flour and salt in a mixer using the paddle attachment. Add the 2 ounces of cold, cubed butter and mix until the butter has disappeared into the flour. With mixer running at a low speed, slowly add 1 cup of the ice water. If you need to add more water to make the dough come together do so, but go slowly. The moisture content of flour can differ. Sometimes you will need more water and sometimes you won't. The idea is just to watch the bottom of the bowl and add water VERY SLOWLY, adding just until it comes together in a large clump or two. The détrempe should be soft but not sticky. If it is a little sticky, don't worry. It will absorb some moisture overnite and you can always work more flour into it on Day 2. Then, wrap the détrempe well in plastic and retire it to the fridge overnite. Mmmm. I'm still savoring the dinner we ate tonight. It was an impromptu thing and based entirely on leftovers, as fried rice should be. I adapted a Food Network recipe to make it healthier. Their method of cooking each ingredient family separately (and using copious amounts of fresh ground pepper and ginger) were both key to making this my best effort at fried rice yet. In the past I've sort of sauteed everything together in stages (here you'll saute and remove, saute and remove until everything is cooked separately, then just quickly reheat all together). 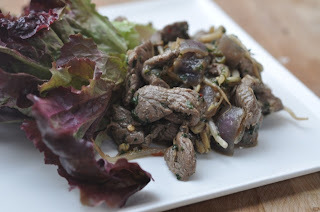 I had a few cups of white basmati rice in the fridge (don't even think about making fried rice with freshly cooked rice; it'll be way too wet) as well as half a flank steak from the fajitas we had a night or so ago. The flank did have a rub on it (chili, brown sugar, garlic) which I'm sure lent a little something extra to the rice. Anyway, I absolutely recommend the one-two punch of fajitas one night this week followed by fried rice a few nights later. Just don't forget to make the rice in between so it has time to sit in your fridge and do its thing. Prep all ingredients. Cube the meat, dice all veggies. Whisk eggs in a small bowl. Reserve everything. Heat a large heavy-bottomed skillet over medium-high heat. Add 1 tablespoon of the oil. Add chicken or beef and cook for a couple of minutes until lightly browned. Add the onion, celery, garlic, ginger, and green onion and saute for 2 minutes or so. Transfer contents of the skillet to a large bowl and reserve. OPTIONAL - Saute the cabbage and bean sprouts in the same skillet (you may add a teaspoon of oil) for 3-4 minutes. Then reserve in the bowl with everything else. Return the pan to the heat and add one more tablespoon of oil. Season the eggs with salt and pepper and add to the skillet. Stir the eggs constantly until almost set but still moist, then transfer egg to the bowl with the meat and veg. Break the eggs up so there are no large clumps. Return the pan to the heat and another tablespoon of oil. Add the rice to the pan and break up any clumps. Season with salt and pepper and stir. Then, allow the rice to cook undisturbed until its gets slightly crispy, about 2-3 minutes. Add reserved meat, veggies and eggs to the skillet and heat thru. Taste for seasoning and serve.